BMW notably didn’t use any carbon-fiber in the next-generation 5 Series, but the OEM behind the i3, i8, and 7 Series hasn’t given up on the exotic substrate. Asked by Center for Automotive Research President and CEO Jay Baron this summer if BMW, a recognized “carbon fiber leader,” would continue to develop vehicles with the composite, BMW head of lightweight design and vehicle weight Florian Schek was confident. “Yes, of course,” Schek said July 31 during the CAR Management Briefing Seminars. Schek said the main challenge was the cost of the substrate, which consists of carbon fiber strands in a curable resin. (Think of how rebar within concrete results in a stronger structure.) A GM expert last fall described a carbon fiber range of between 1,000 to 50,000 strands, known as “tows,” which allows for an infinite number of composite possibilities. “The cost is still too high,” Schek said. It was also still a “difficult technology” to add into a vehicle, he said, and BMW didn’t incorporate it into its 5 Series because of the price point and the production of the vehicle spanning three countries. However, “we will see the next cars” in BMW’s lineup start to incorporate carbon fiber starting around 2020, he said. BMW built the entire body of the i3 and i8 out of carbon fiber. It used carbon fiber sheets to reinforce steel and aluminum elements in the mixed-materials body-in-white of the 7 Series. 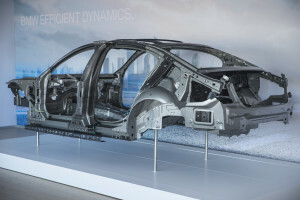 BMW uses other composites, such as glass fibers, in its vehicles, but carbon-fiber reinforced polymer is the only composite it uses structurally, Schek said. Schek’s confidence echoed comments by General Motors body structures advanced composites engineering group manager Mark Voss last year during SEMA 2016. 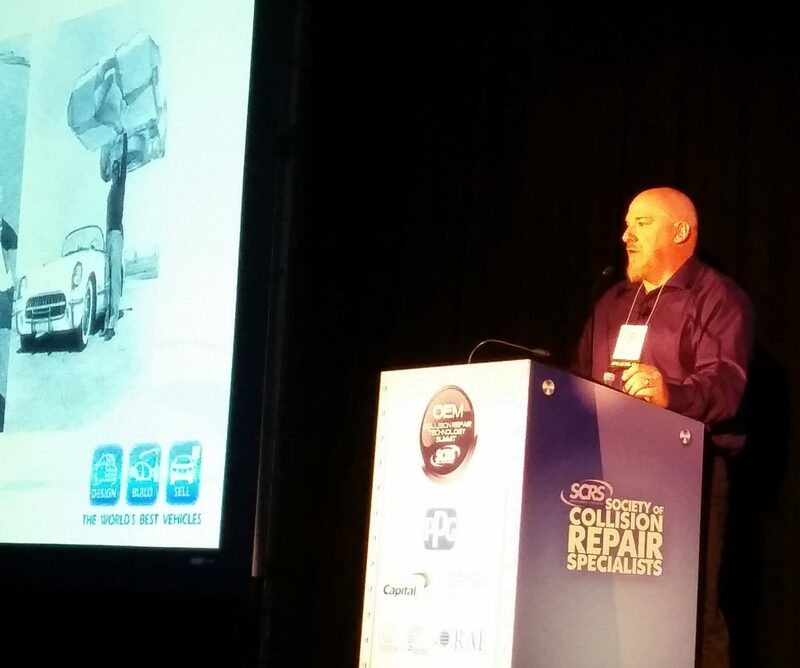 Voss, who spoke at the Society of Collision Repair Specialists’ OEM Collision Repair Technology Summit, said he encouraged the audience to return in a couple of years — they might see much more composite in use. “I like my job,” Voss joked, so he couldn’t reveal more. Fascinated by what Voss and Schek had to say? 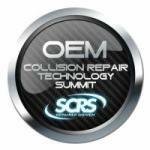 Don’t miss your chance to be in a room with OEMs and other experts during this year’s Society of Collision Repair Specialists’ OEM Collision Repair Technology Summit Nov. 2. Innovators in automotive technology and other subject matter experts will be on hand for “How Automotive Research is Driving Change”; “The Impact of Advanced Vehicle Systems on Routine Repair Process and Procedure”; and “The Hidden Dangers of Vehicle Technology, Improper Repair Methodology and Your Liabilities.” Space will be limited; early registration is encouraged. The sessions are part of the SCRS Repairer Driven Education Series Oct. 30-Nov. 3 during the SEMA Show in Las Vegas. Register here for the individual classes or the series pass package deal, which includes the entire week of classes, all three parts of the OEM Summit and the Nov. 2 Sky Villa afterparty. Less than 5 percent of 2014’s vehicles met the 2025 fuel economy target, according to Voss. Simple design optimization won’t be enough to achieve what OEMs need to do — switching materials will be a given. “Composites, obviously, is gonna play a part in (meeting that),” Voss said. However, he anticipated shops would see only one or two parts go composite on mass-market vehicles — at least at first. He said shops could expect between 100 and 200 pounds coming out of vehicles over the next couple of years. 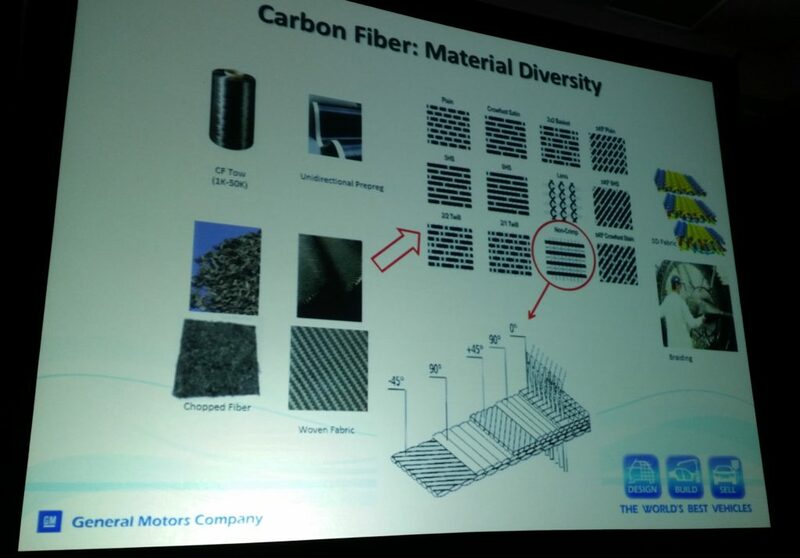 Growth in carbon fiber is “exponential right now,” according to Voss. “It’s only going to continue to grow moving forward,” he said. Carbon fiber is even being designed specifically for automotive, not simply borrowed from the aerospace industry. That’s never happened before, Voss said. However, he also noted how competing substrate industries have stepped up their lightweighting game. Structural carbon fiber composites were generally replace-only, unlike GM’s earlier forays into fiberglass parts which were repairable in the fashion of boat composites. Some nonstructural Class A exterior carbon fiber panels can be repaired with certain body fillers “believe it or not” — but that’s not an option when designers opt for visible substrates, according to Voss. The latter can be fixed, but the party doing so needs to be highly trained, he said.